Lincolnshire students got the chance to strut their stuff when their college brought a little bit of London Fashion Week to town. Hairdressing students at North Lindsey College, in Scunthorpe, were tasked with designing hair, make-up and costumes to illustrate a chosen theme for a contest judged by lecturer Hazel Wheatley and local experts Sarah Cockin and Julie Joyce. 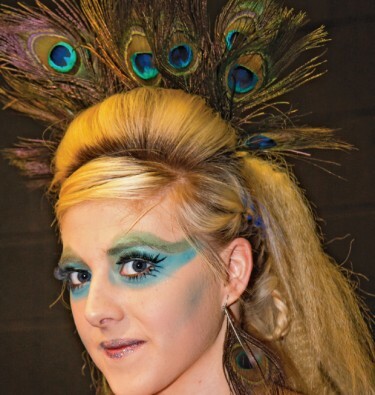 The level one winner, Emily Bushell, 17, created a peacock look for Laura Richardson, 18 (pictured above). She said she wanted to base her design around a bird whose “vibrant colours” she had always loved. Other entries included designs inspired by Salvador Dali, an African warrior, a parrot and Alice in Wonderland.